I realized this post is late. I usually try to write a race review within a few days of said race but somehow I slacked off with this one. Last month I ran a 5k. The last time I ran a 5k was the Strike Out ALS 5k on July 15, 2014. And my last PR is from 2011 with a finish time of 29:48. The original plan was to run it easy and for fun due to 8 miles I had to do the day before. Well, thanks to Mother Nature, she decided to leave us with ice on the lakefront that I had so much trouble walking much less running in those icy conditions. I decided it was not worth risking me falling and injuring myself knowing I had a race the next day. I left my running group and decided to go home. Thankfully it wasn’t icy anymore on Sunday but it was still cold and windy. I arrived with plenty of time to the Oak Park/River Forest High School to pick up my bib and to wait for Lisa. Once she got there we found a bathroom and then waited for the race to start. We talked and talked some more. Finally it was time to run. 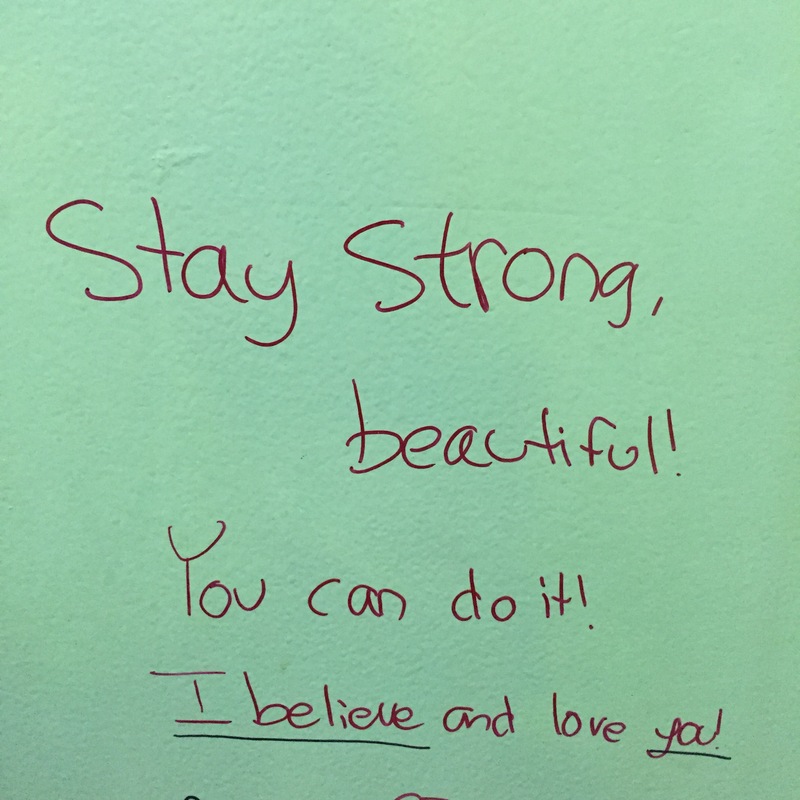 Saw this on the wall of the bathroom stall. I decided to run with Lisa hoping that I could keep up with her. No, she is way faster than me. I held on for half a mile and I told her to just go ahead without me. It was a small, neighborhood race so it was nice to run through Oak Park. There were a few spectators but nothing compared to the bigger races. There was a water stations around 1.8 miles and by then I was very thirsty. It was also windy. I wore a long sleeve Oiselle shirt and a jacket. I got hot and took off the jacket and wore it around my waist. I ran and walked and 3 miles sure went by fast. Finally I saw the finish line and I was done. I went inside to wait for Lisa and was amazed at all of the post race goodies. 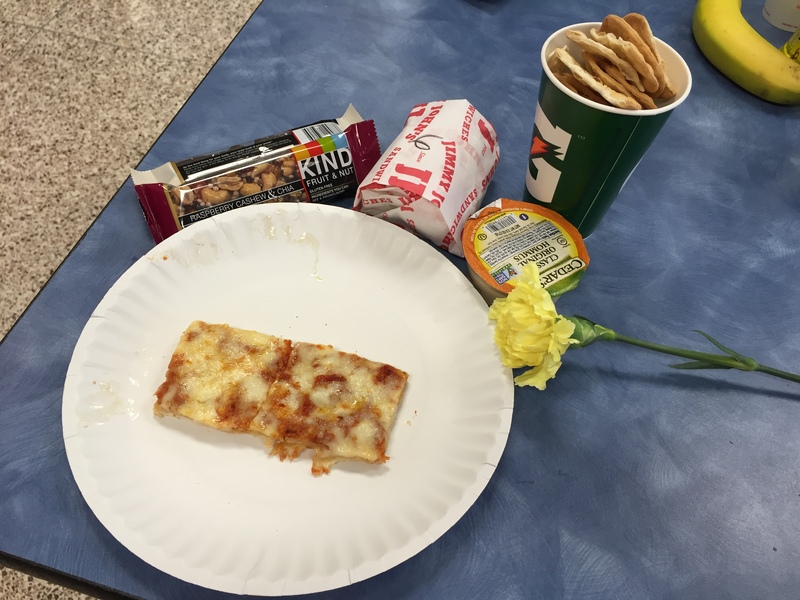 There was Nestle chocolate milk, pizza, Jimmy Johns sandwiches, hummus and chips, and KIND bars. I also got a flower. All of this stuff for a 5K? The last race I remember having this much food was at the IMT Des Moines Half Marathon. 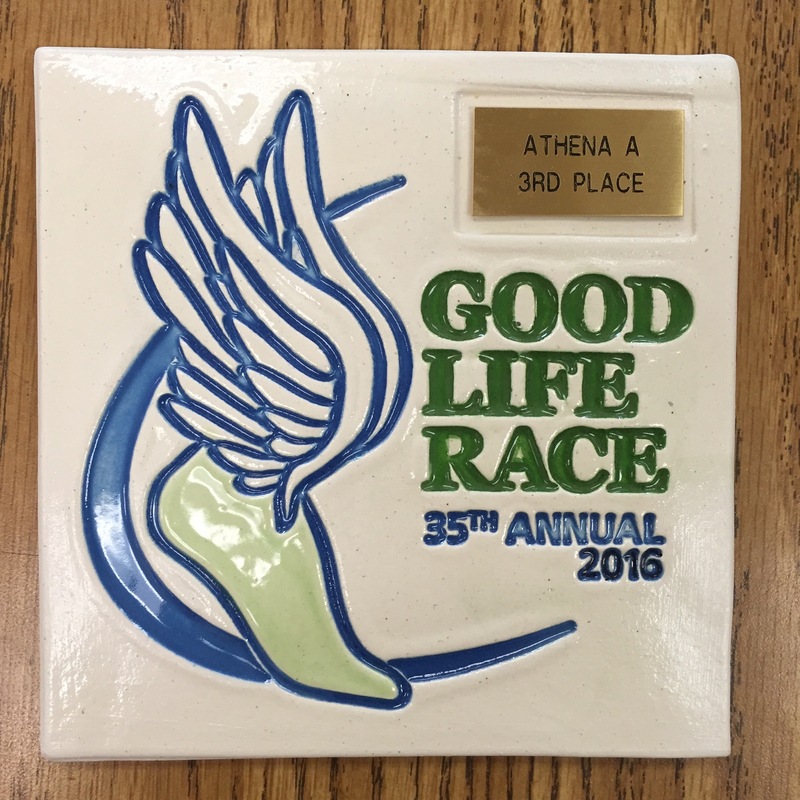 A few days later I found out that I had placed 3rd place in the Athena A Division. For sure I was surprised but also happy about it. Overall, it is a great race. The cost is reasonable, free parking, close to Chicago area, and amazing post-race food. I will definitely plan to run this race again next year. Congrats! That ice is insane for this time of year. I really like what you’ve done with the circular blog photos- very pretty. Thank you. Just trying to do something different with my pictures.